Alas! Hattie Watson’s Columns have run their course and her books have been published, two of them for readers to keep in their libraries. We have spent the late spring and early summer letting go that popular column, getting the news out about her new book, and feeling regret that we will not be reading Hattie Watson in the Advertiser anymore. However, such a loss makes way for a new writer, and one from our midst. Suzanne Holmes (Mrs. Walker) has been invited by the staff to take up the garden writer’s pen and bring us, as often as she is able, her observations and instructions that will help us with our gardening. 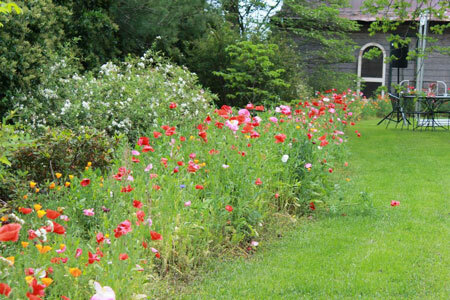 The beautiful red poppies on this front page are a product of her work in bringing her yard into focus for the wedding of their daughter Callie. 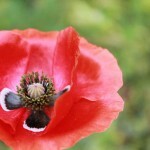 She tells us about choosing the poppy, planting and enjoying the result. Suzanne has been well known in the communities of our county for many years. I met her almost a decade ago on television – she was appearing on TV and for her work and her daughter Callie was associated with this newspaper, and Callie had said she needed to go see her mother on television. Another staffer joined us at Callihams where there were plenty of TVs for watching, and there she was, Suzanne Holmes, talking about horticulture in some form (have forgotten the subject of her presentation). Those who have heard her speak at garden clubs and civic meetings know the strength of her charm. She started her life out in her hometown near Clemson, Oakway. It was her uncle who was a Clemson Extension Agent and inspired her to take up studies at Clemson (horticulture), for the BS and MS degrees, and to eventually work as an agent herself. She taught at Strom Thurmond High School for 11 years when she was one of only two women in the state teaching horticulture. She was the County Agent for Aiken County for 12 years and is now a Horticulture Program Assistant for Richmond County/Augusta for the University of Georgia Extension service. Mrs. Holmes is an elected official, a Commissioner of the Edgefield Conservation District. She knows about conserving land, water and other resources. Watch for this topic among her writings. Suzanne tells us that a family member had a dairy business (she could have chosen animal husbandry!) and it was her grandmother who had the most beautiful flowers in her hometown because she knew how to take the dairy cow manure and make those flowers grow. Suzanne will be sharing her years of work and study with us as she talks to us about plants, gardening, some how-to’s and maybe some how-not’s. Find her article this week on page 2 of the print edition. 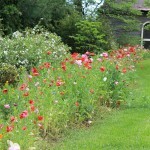 A poppy border lined the yard at the Walker and Suzanne Holmes home in the spring. 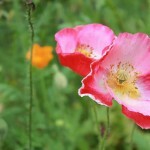 Suzanne is our new garden writer and she tells about those poppies in her first article, found on page 2 of this week’s print edition.